Let me start out by saying having a blended family is HARD! I totally understand why Jesus created marriage to be a one time thing, because there are so many struggles that each family member has to deal with. 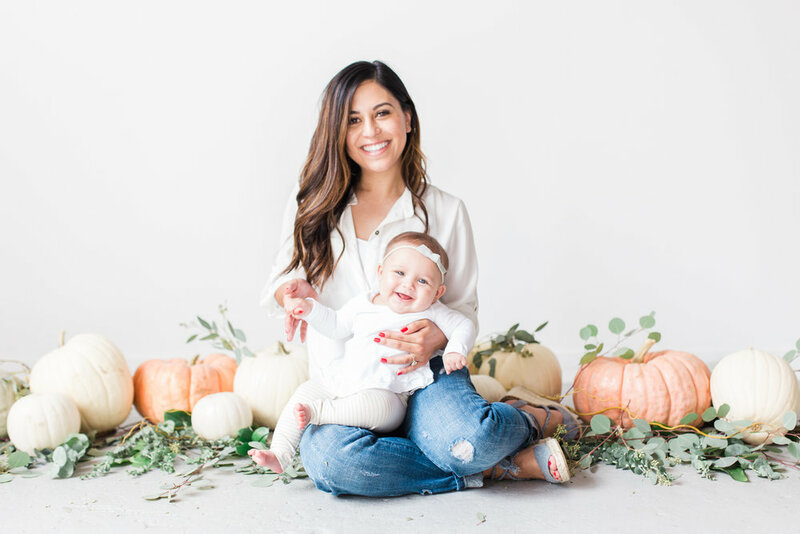 As a stepmom I deal with learning how to mold into Brian and Claire's life while trying to also bring my values, goals, or family traditions. Brian has to learn how to adjust to co-parenting with someone totally new and Claire has to learn to adjust to just about EVERYTHING.... It is just a lot of adjusting while trying to take into account everyones emotions/feelings/timing.. But as the holidays approach us I get frustrated with the same yearly dilemma of not getting to spend the "major" holidays with the whole family. It is not out of selfishness, because I think it is very important for Claire to spend time with her mom and her mom's side of the family. Claire always tells me about the wonderful memories she creates with her mom and cousins, I am truly happy that she gets those special moments. It is just out of sadness that I want the whole family together especially with this year being all of Karis' firsts! 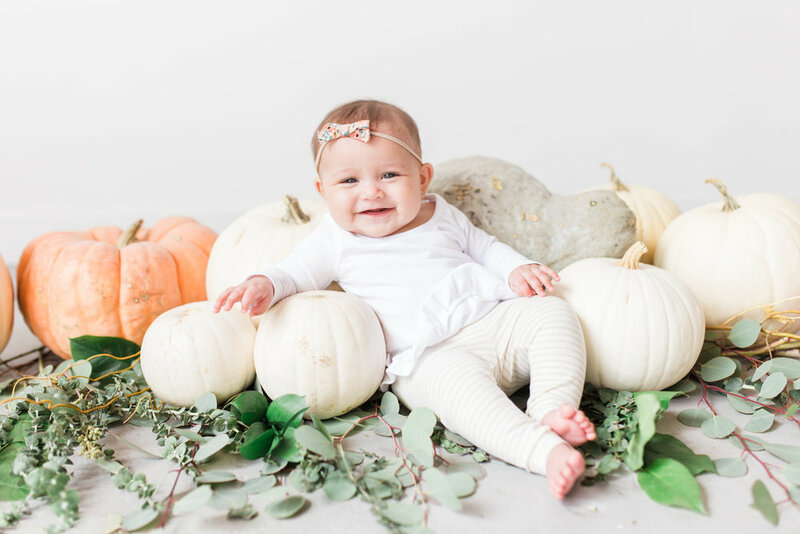 For example we were not able to visit the pumpkin patch this year because of how the weekends worked out, but I was desperate for Karis' to get her first pumpkin pictures. Thankfully our sweet friend Elizabeth Jones took these snap shots. I was bummed to not have Claire be in the pictures with her sister but it was one of those "it is what is it" situations. I am not sure that things will get easier as more babies come into the picture and the kids get older, BUT I am thankful that at least we get to spend one "major" holiday a year as a whole family unit. If you are a seasoned blended family I would love to hear your input on what works for you and your family. 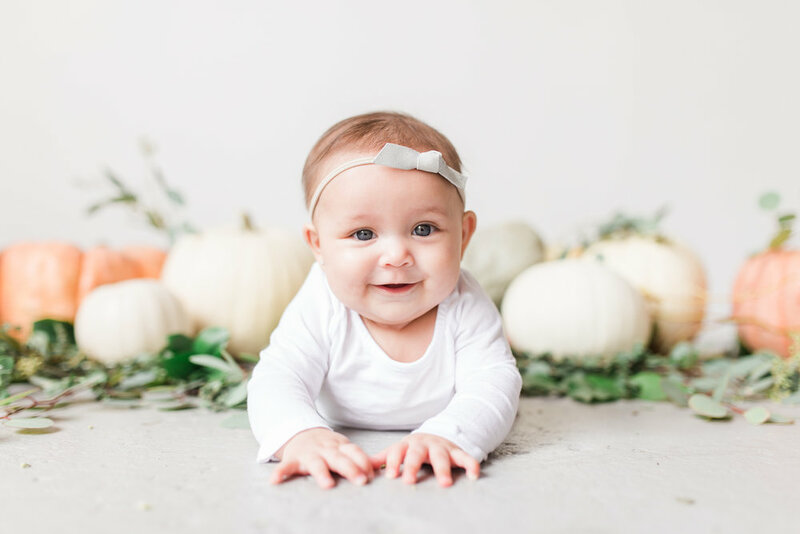 In the meantime enjoy these ridiculously adorable pictures of Karis during her first October outside of the womb!